Monopoly, an early 20th century board game, has been passed down to millions of people since its inception with variations as early as in 1903 with Lizzie Maggie's The Landlord's Game. It became a cult favorite, with some auction monopoly games created by university students (e.g. a 1909 game in the University of Pennsylvannia's Wharton School of Finance), families and neighbors (Ruth Hoskins, 1929, teaching the game to her Quaker friends, rearranged by Jesse Raiford, passed down to Charles Todd, then to Charles Darrow), imitation games (Finance in 1932 by Dan Layman, Easy Money in 1935 by Milton Bradley, Big Business in 1936 by Transogram, Inflation in 1936 by Rudy Copeland), & even briefly by Parker Brothers (Fortune in 1935). The game's original intent on teaching how unequal distribution of wealth bankrupts your opponent has been played for pleasure, & has become one of the world's most recognizable board games in history, published in several languages, & countries. 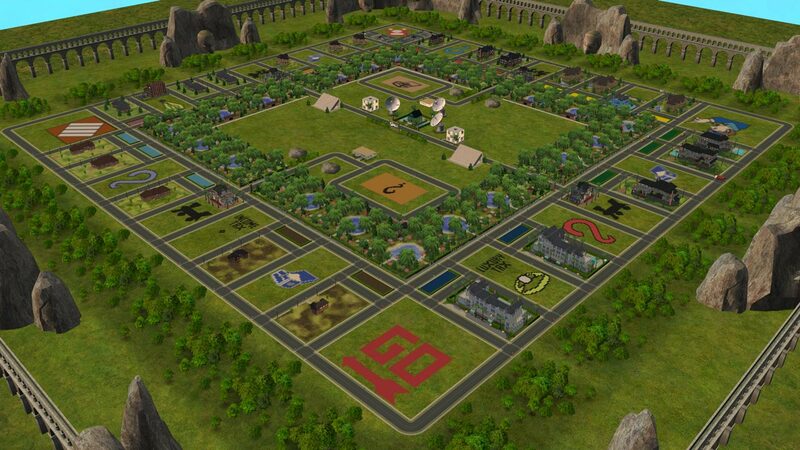 Ladies and gentlemen, NCI presents to you one of The Sims 2's finest board game inspired neighborhoods. 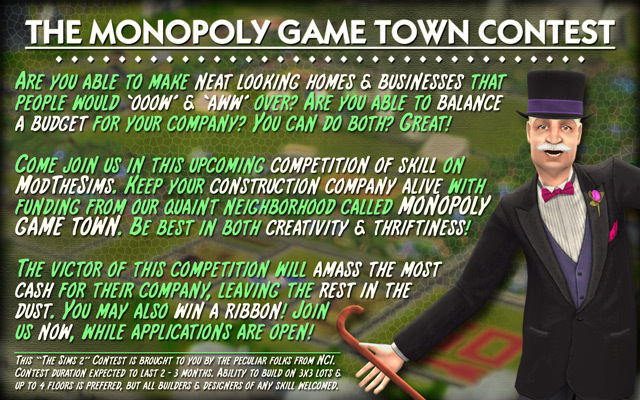 We introduce to you...Monopoly Game Town! And now a word from the master of the board, Mr. Monopoly himself, "Rich Uncle" Pennybags. So, first and foremost, the layout is completely inspired by the board game itself. Each coloured group has two to three houses with similar themes. You can read about each house from the comments section that follow. 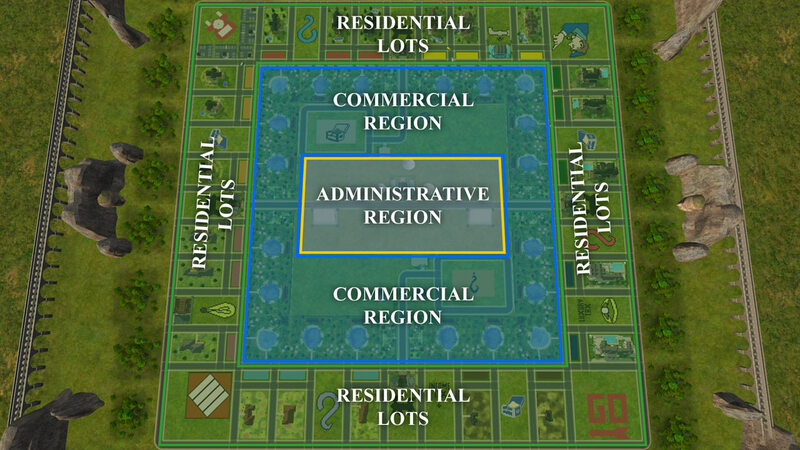 The neighborhood has a poor district leading up to a wealthy district, just like you would imagine from the prices of the property cards in the game. The neighborhood is heavily residential based, with only a couple of lots prepared for converting into shops. If you wish to add to the number of shops available, place them around the Chance or Community Chest card areas. Much of the community lots are parks, with grills & swings. 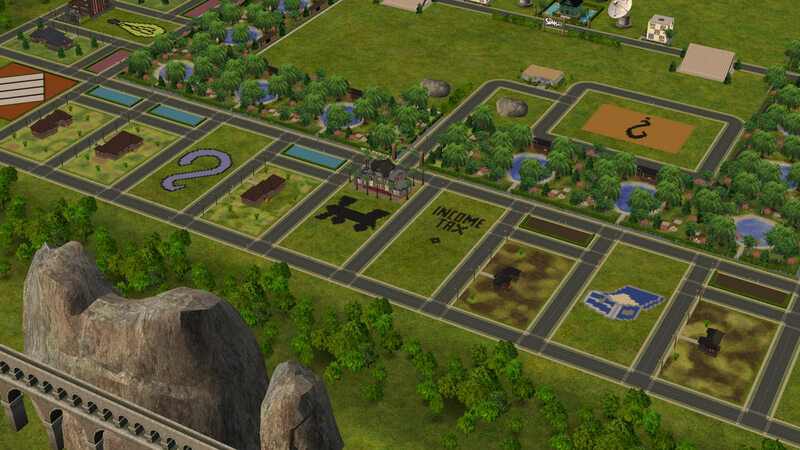 Other community lots serve as decoration (although are still able to be visited by your Sims). The board is surrounded by aquaducs, trees & ancient head stones that watch over the activities of the people living in the neighborhood. 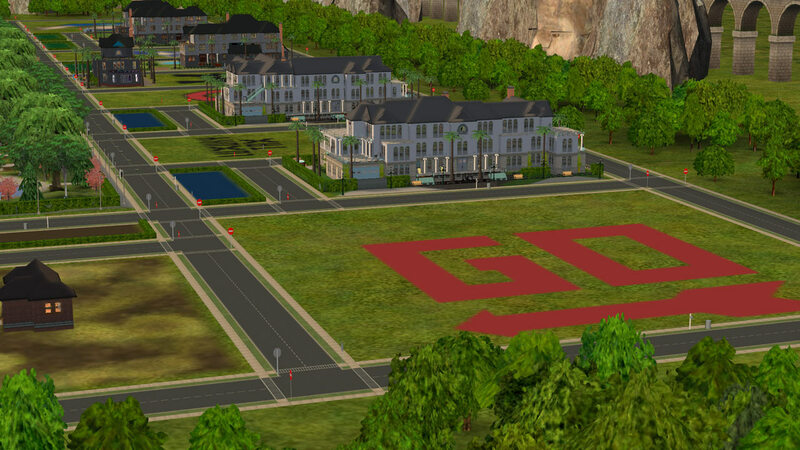 To maximize compatibility, everything from this neighborhood is base-game created, thanks to Numenor's AnyGameStarter. Absolutely nothing in the neighborhood created has custom content by downloaders, including myself. So go crazy unfurnishing those homes with your own furniture, lol. Or if you absolutely despise the homes made by me, deletes those lots and make your own! Just make sure to replace those homes with 3 x 5 medium lots, unless you want to divide the areas into smaller bits. If you want apartment towers, place them in the middle of the board (the "Administrative Area") to make the neighborhood look like a metropolis. Cool! So I can play this board game in multiplayer with other Simmers? NO, absolutely not. This is just a neighborhood with a Monopoly board layout. The neighborhood is not programmed for actually gaming with dice, play money, etc. Maybe someone with C++ programing knowledge can do that for us Simmers, lol. What files are included with this download? *Only caveat: The so-called apartments are currently residential lots, & needs to be converted to an Apartment base by placing the proper apartment doors, and changing the lot's zoning. If you have the Apartment Life expansion pack, you can download the rar file Dice Apartment.rar from the Comments section (the second entry after Boardwalk). 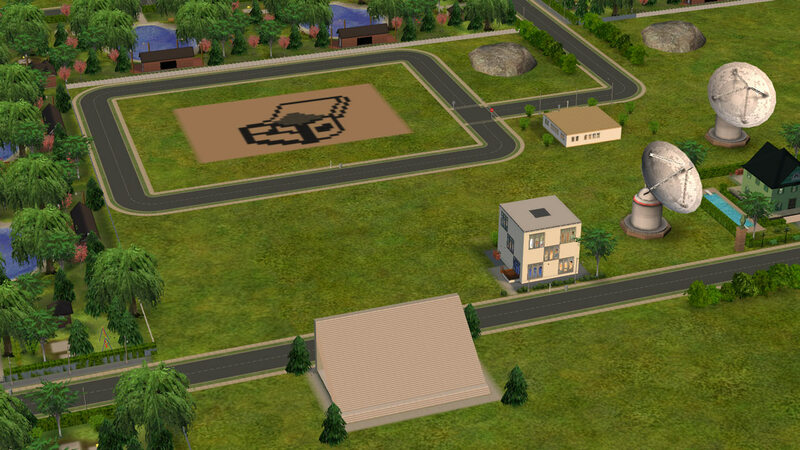 The file is in Sims2Pack format, & has the proper doors installed. Why would you want this? Well, if you just despise those lots, or want to download only a few lots, download this version, & get cracking on filling those empty spaces. Now we're still offering you those decorations around the board, and Pennybags' home in all the neigborhood versions, but at least you can make the world your oyster by building the lots yourself. You must hate those homes I've made, huh? Or maybe you're getting close to filling your bandwidth, whatever. Can I download only a house or two (or three or ten)? Yes you can, actually it's required by the website, lol. The neighborhood has 22 main residential lots, each colour coded and described in their property cards. You can find those in the Comments section of this download, along with six pictures of each lot (mainly pictures of each level of the houses). The coloured strips are bundled together into one rar file (NCI-ColouredStrips.rar), and so are the cartoon spaces on the board (NCI-CartoonSpacesCorners.rar). How do you install this Neighborhood? 1. Download the neighborhood rar file of your choice. 3. Extract the rar file inside that folder. 4. That's it, charge up the game. Now, as for the Storytelling pictures, simply copy the files into the EA Games/The Sims 2/Storytelling folder. 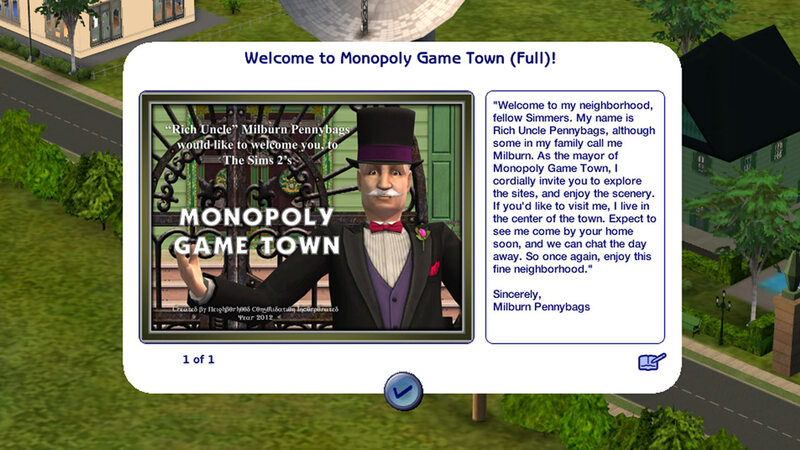 The welcome screen says to visit Pennybags in the center of town. Why isn't he in his house? That's because we're short-changing you on the goodies, lol. No, actually, it's because there's a separate approval process for character Sims in The Sims 2. You can now download Milburn Pennybags, and assign him a political career, so that he can become Mayor of the town, by clicking the link HERE. The following is a list of lots from the comments section. That way, you don't have to sift through Pages 1 and 2 of picture intensive comments section. - Mootilda's "Lot Adjuster 3.6" for adjusting the coloured lots into 3x1 sizes, & dice apartments & small parking lots into 2x2 sizes. - Numenor's "AnyGameStarter 2.1.1" for making it possible to work on base-game only files (along for base-game/Apartment Life expansion pack files for the apartment files). - Phaenoh for providing recommendations on improving the neighborhood. 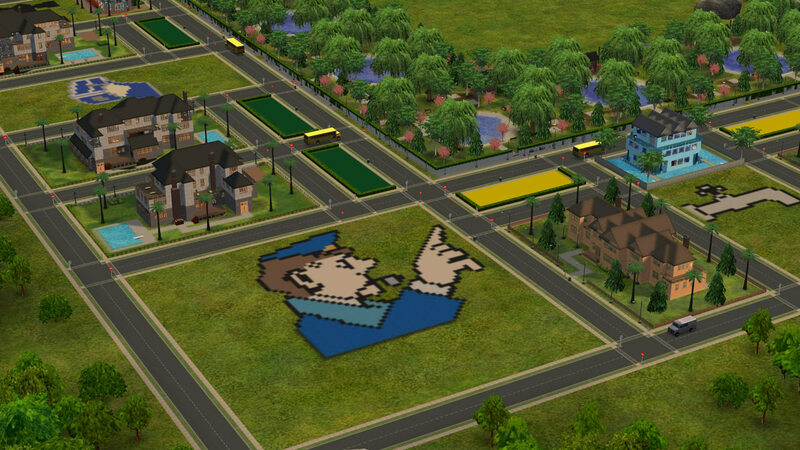 - Maxis' SimCity 4 game for making road layout for importing into The Sims 2. AND a thank you to Mootilda and her HoodReplace program. It was useful in getting rid of a Sim user error that HoodChecker reported. Could be removed for those of you who already have the neighborhood, but the updated file (June 14, 2012) removed the error from start-up. DO NOT OVERWRITE your old neighborhood, as the new one has the same file names. EDIT: Apparently it can't be removed using HoodChecker. Luckily, the sim user data leftover isn't a critical error type thing. No one was related to the Sim person in question. So there can't possibly be gossip or memories about it. 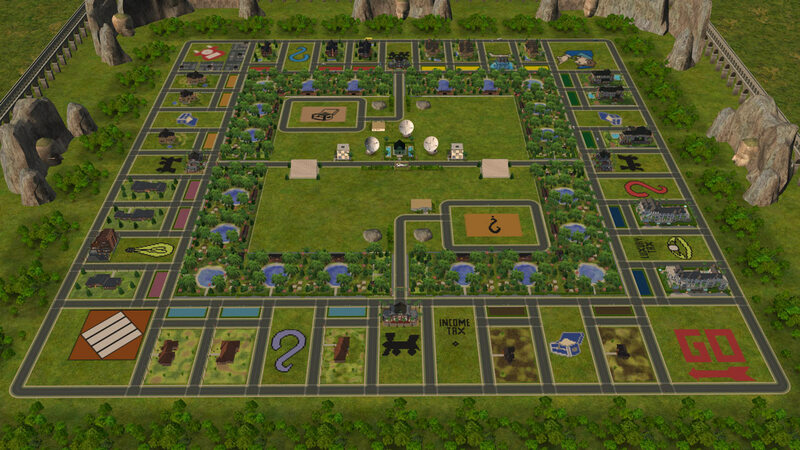 There was a building contest (that ended) for Sims 2 Players that can be found from the link provided HERE. 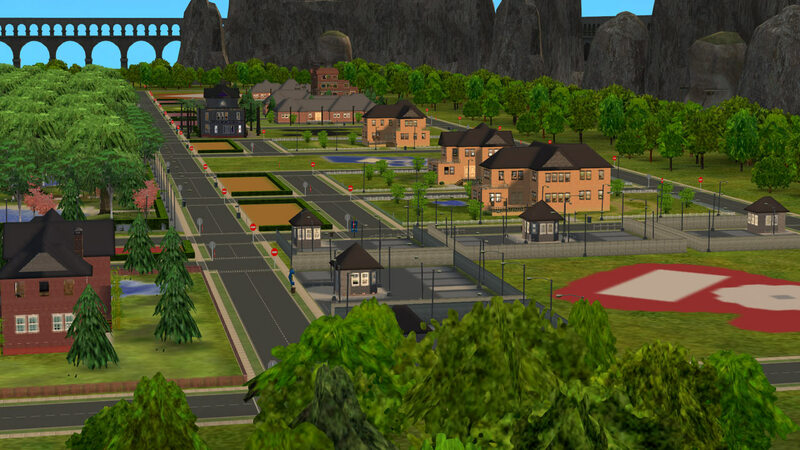 NCI-MonopolyTownTerrain.rar | Description: TERRAIN: Contains the SimCity 4 neighborhood terrain file, uploaded August 24, 2013. NCI-N044.rar | Description: MINIMAL VERSION: Contains coloured strips and Pennybags&#039; home. Updated using Lot Compressor May 21, 2015. NCI-N045.rar | Description: ROADS ONLY: Contains roads and Pennybags&#039; home. Updated using Lot Compressor May 21, 2015. NCI-N046.rar | Description: FULL VERSION: Contains everything up to and including Pennybags&#039; home. Updated using Lot Compressor May 21, 2015. 1. Download the neighborhood rar file of your choice (N046 is the full neighborhood with houses/lots). If you downloaded the full neighborhood (N046), there will be a Storytelling pictures folder. Simply copy the contents of the Storytelling folder into the EA Games/The Sims 2/Storytelling folder. You may notice that the N04# folders have Storytelling folders too. Please keep those in, as the game won't recognize the Neighborhood screen without both folders in their respective places.